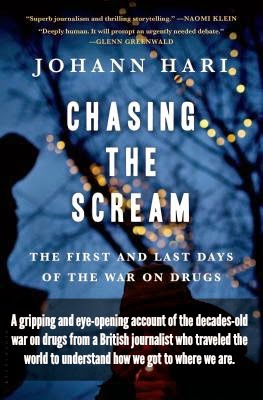 British journalist Johann Hari spent three years traveling around the world to understand the war on drugs, culminating in Chasing the Scream: The First and Last Days of the War on Drugs. His book spans the start of the war in the U.S. nearly a century ago in the small office of Harry Anslinger, an assistant prohibition commissioner and, later, the first commissioner of the Federal Bureau of Narcotics, to the more recent beginnings of its end in Canada, Colorado, Portugal and Sweden. Hari lays out heartbreaking, often gruesome and unbelievable stories of prohibition and legalization to illustrate how historical battles to eliminate drugs have succeeded and failed, how they have shaped--and been shaped by--race and racial tensions in the United States and beyond and how they have influenced so much of our contemporary cultural thinking. In 2011, Hari was the subject of a journalistic scandal involving, among other things, sourcing and citing quotations. This experience seems to have made the research in Chasing the Scream all the more thorough; each chapter is introduced with an explanation of how and why Hari came to interview people on a given topic. This approach results in book that is more than the sum of its parts; Hari does not just present information for readers to interpret, but invites readers along on his process of discovery. Though not all readers will agree with Hari's conclusions, it's likely that Chasing the Scream will invite a careful reevaluation of what we thought we knew about drugs and why we fight so hard against them.